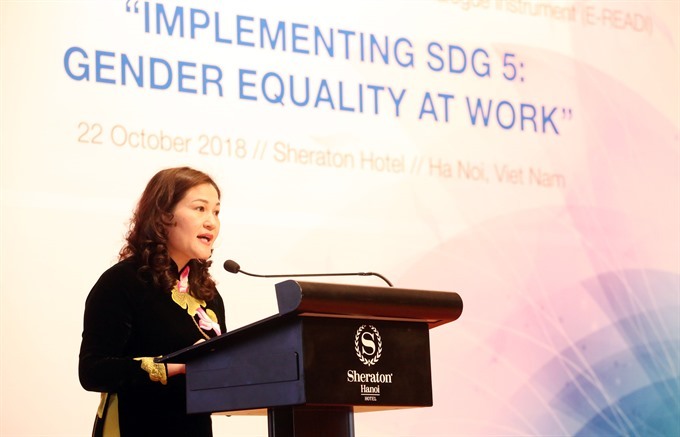 HÀ NỘI — Officials on Monday discussed the implementation of gender equality in the workplace during a discussion held by the Ministry of Labour, Invalids and Social Affairs (MOLISA) in co-ordination with the ASEAN Secretariat, European Union (EU) and EU-ASEAN Dialogue Enhancement Programme. The activity was part of the 3rd ASEAN Ministerial Meeting on Women in Việt Nam. The ASEAN-EU Dialogue on Gender Equality and Empowerment of Women and Girls was attended by high-level representatives from EU and ASEAN member states responsible for promoting gender equality and empowering women and girls. “2017 was a successful year for ASEAN to honour women and girls,” he said. The European Union promotes gender equality within its borders as well as in relations with partner countries, especially in development cooperation, according to the director. ASEAN and the EU are committed to protecting and promoting the human rights and fundamental freedoms enshrined in the Universal Declaration of Human Rights and its international instruments in which the ASEAN countries participate. An EU-ASEAN human rights policy dialogue was held in Belgium in 2015 and followed by a second human rights policy dialogue in 2017 in the Philippines.